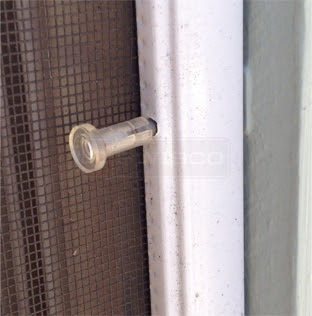 Cleaning the screens on your Marvin windows and doors is best done by removing the screens altogether, laying them on a flat clean area, like a sidewalk, and spraying off any dust with water from your garden hose. To remove the interior screens, simply lift up on the finger lifts (or finger routes) at the bottom of the screen. This will cause the spring-like mechanism at the top of the screen to compress. Using the finger lifts and continuing to apply upward pressure, draw the bottom of the screen out of the window. On Marvin Clad Ultimate Double Hungs, push the screen outward, grasp screen frame and pull down slightly. Turn the screen sideways and bring it through the window into your home. Marvin recommends that the operating sash on the double hung windows be removed from the window before attempting to remove the screen. Every screen installed on Marvin products has a label affixed to it that states the following, "WARNING: Screen will not stop child from falling out of window. Keep child away from open window." If the sticker is removed, please take extra precautions to make sure children do not lean on the screen, especially when the window is open.